on an acrylic base, is awaiting a handmade shade. How illuminating . . . designer Melissa Woody's "lightbulb moment" of realization came after waiting for more than a year to get a custom lampshade made for a client. With only two shops in Dallas capable of creating custom shades -- and both of them endlessly backed up -- Woody seized on the opportunity to fill a need. Earlier this month, she opened her own lamp store, The Lamp Shoppe at 1515 Dragon Street. 214-741-53oo. It's open to everyone, not just designers. The idea, says Woody, is to turn around most custom lamps in a week to 10 days. Some can be done in just a few days, she says. A customer's treasure being turned into a lamp with acrylic base. 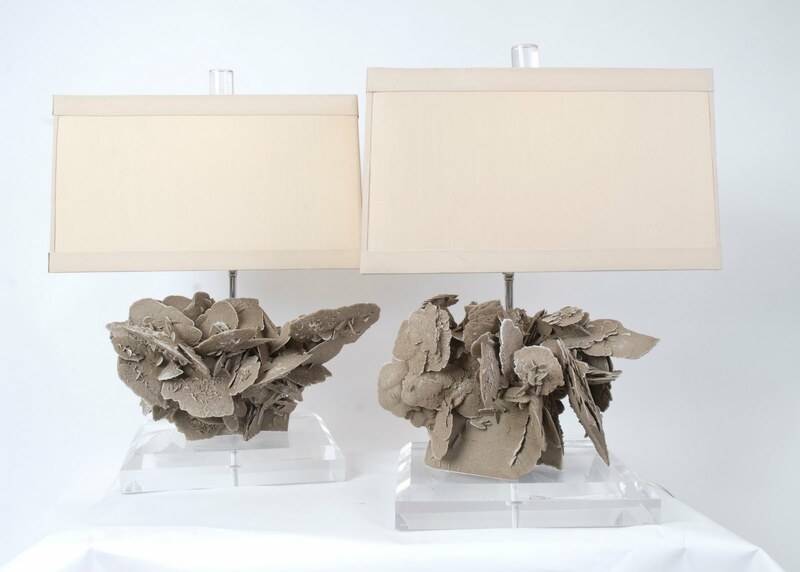 To be able to produce custom lamps and shades in record time, Woody has assembled a top team, including Lee Ann Galyean, well-known by interior designers for her 15 years helping to design custom lamps at Yang's Double Happiness. All the work is done onsite, and Galyean is joined by two experienced seamstresses and a full-time electrician who can wire new lamps, rewire old ones, and assemble just about anything you can dream up. You can also buy from a selection of ready-made silk or linen luxury shades, which Galyean can help you customize by adding special trim. Lampshade options include pleated, full fabric, hardback, and smocked. right color not only makes the lamp look better but makes the cord less obtrusive. mimic stone like malachite and marble. He also creates bases in fine gold and silver leaf. 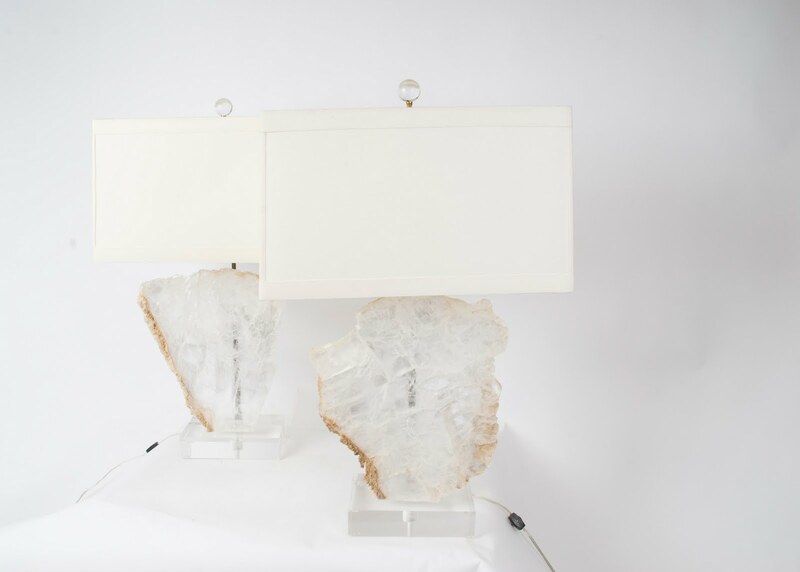 Lamp bases can be made from just about any material, including Lucite, stainless steel, or natural materials. with Lucite bases and custom shades. Melissa Woody's mineral lamps with Lucite bases and custom shades. Woody has specialized in lighting for years, selling her custom designs at The Mews, Nick Brock Antiques, and Lover's Lane Antique Market. Rod Stewart recently bought one of her mineral lamps, and Angie Harman is a client. 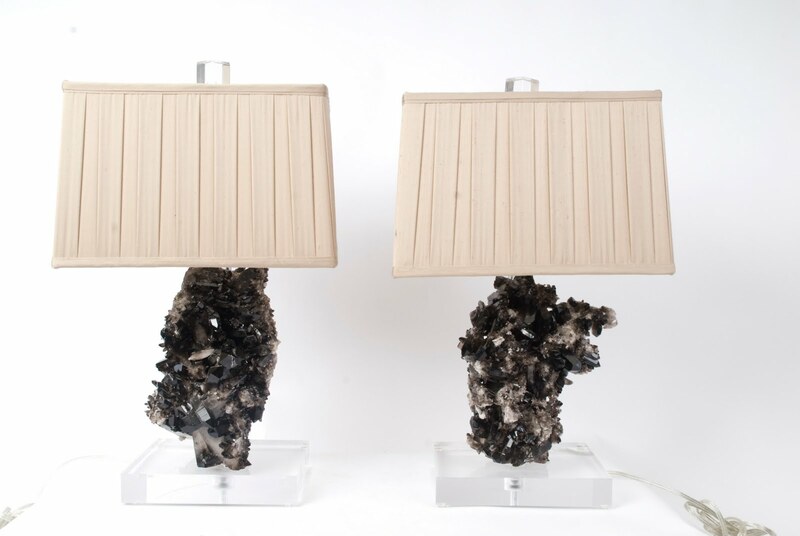 Her custom lamps are made from various natural materials including petrified wood, selenite, satin spar, black quartz, and Bolivian amethyst. "I've always been known as the Lamp Lady," says Woody, who has been an interior designer since 1991. "So, it makes sense that I'd open my own lamp store, doesn't it?"